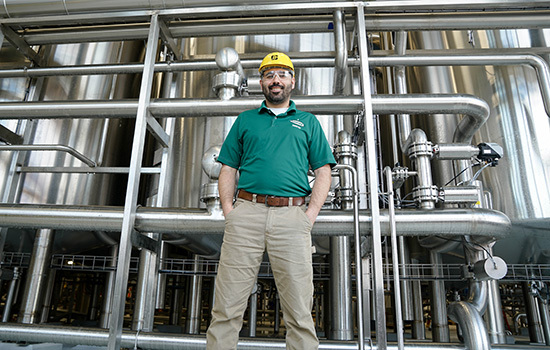 Genesee Brewmaster Steve Kaplan ’05 helped implement a $49.1 million modernization project at Genesee Brewery in Rochester. Genesee Brewmaster Steve Kaplan doesn’t hesitate when asked about his favorite beer to brew. Kaplan knows challenging. He recently helped implement a $49.1 million modernization project at Genesee Brewery. The project, which began in October 2016, included a mash filter to extract more sugars from ingredients, 24 new high-efficiency fermentation tanks, a new 13,000-square-foot building housing a state-of-the-art control room and an automated system to oversee the brewing process. The improvements have helped New York’s oldest brewery operate more efficiently and sustainably—decreasing water and natural gas usage and creating less waste. Kaplan started at Genesee in Rochester in 2011 after working for Anheuser-Busch in Baldwinsville, N.Y., for four years. Kaplan said he found his calling at Anheuser-Busch, where he learned about the brewing process on the job. He also was part of a modernization project there, which led him to Rochester. The Genesee brewmaster at the time visited Anheuser-Busch to look at old equipment for sale. Kaplan gave the tour. A few months later, Kaplan started at Genesee as an assistant brewmaster overseeing the hot side of the brewing process. He became head brewmaster in January after two of his superiors retired. He has loved the job since day one. Kaplan said his background as an engineer was valued immediately because he was able to bridge the gap between old and new equipment. “When something breaks that has been in service for 30 years and the guy who designed it died in the 1980s, you have to re-engineer it,” he said. He also enjoys the variety. Along with its core line of Genesee beers, the brewery makes the Genesee Brewhouse Pilot Batch Series and Seagram Escapes malt beverages. It also does contract work for hundreds of companies. Genesee Brewery is owned by North American Breweries.